Purchasing a flight ticket, though a simple and quick affair, causes lot of anxiety to many travellers even today due to the fact that airlines frequently change fares. Staying true to our founding goal of “making travel simple”, we continue to innovate on Cleartrip Fare Alerts which will help you save time and money while purchasing a flight ticket. In 2008, we launched Cleartrip alerts so you can easily find the best deals on Cleartrip. In 2012, we launched fare alerts to help you track airline fares. While this earlier version of Fare Alerts sent you frequent alerts at regular intervals of your choosing, it needed to evolve to be able to handle the dynamic airline pricing strategy we have come to witness in the last couple of years. Today, we are reintroducing the totally re-imagined Fare Alerts to help you stay one step ahead. There’s a common myth that Online Travel Agents (also referred to as OTAs) such as Cleartrip, set and change the flight fares actively. But the truth is airlines divide the total number of seats into many classes such as B (12), C (15), V (20), W (22) etc, with numbers denoting seats in that class. As the seats in each class get booked across all OTAs and neighbourhood travel agents, next class is opened up at a higher fare. Fare volatility driving you nuts? Airlines start actively increasing fares in the last 2 weeks, often doubling them 24hrs prior to departure time. Under competitive pressure from other airlines, they also announce flash sales with significantly reduced fares sometimes by even 50%. The catch however is, limited seat availability at such discounted fares. This dynamism in fares fluctuating up and down often during the same day, is bound to drive travellers nuts. Customers typically search anxiously 15-30 times before making a successful booking. While traditional companies may love your time investment on their site, we at Cleartrip believe your time is well spent elsewhere, say with your loved ones. 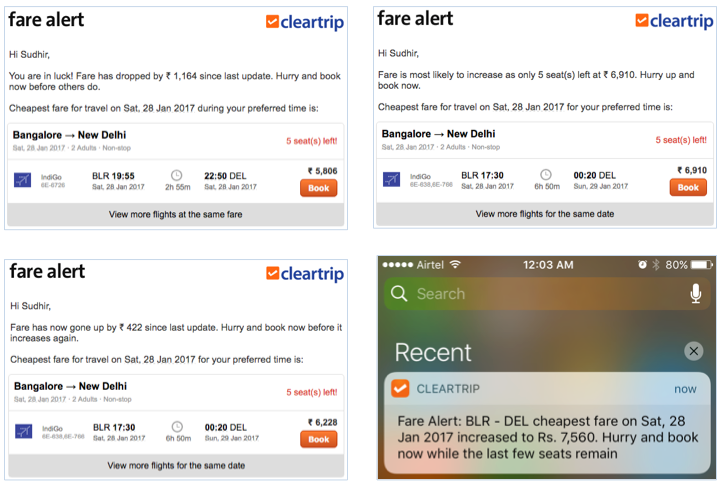 The re-imagined Cleartrip Fare Alerts is re-built from the ground up to minimise the number of searches required for successful booking and time spent tracking airline fares. Just before the cheapest fare to your destination is about to increase significantly so you save money before it increases. Immediately after the fare increases so you can make an informed and timely decision. Instantaneously if fare drops, to take advantage of limited seat availability during flash sales on a great money saving deal. Being the first to know of fare changes, either up or down, can significantly increase your odds of finding the best fare and thereby saving money. Since the alerts are now delivered real-time, via email to your inbox and notifications through your Cleartrip iOS and Android app, you can make an informed and timely decision even without visiting Cleartrip website or app. To learn more about how Cleartrip Fare Alerts work, checkout frequently asked questions. There are so many powerful enhancements to Fare Alerts that are in the pipeline that we can barely contain our excitement. So stay tuned to be wowed and happy tripping!